Want to Make Joy a Habit? Sign up for the Joyletter to get one new discovery on joy each week. You'll also get Your Guide to Finding Joy with the Enneagram as a thank you for joining today. In a free 5-part minicourse, you'll learn the simple practice to instantly increase your joy and spread it to others. You'll be surprised by how easy it is to feel joy daily. When it comes to pricing online courses, I find that most entrepreneurs are like little kids putting change in torn pockets. In other words, they’re losing money. It happens all the time. We invest a ton of time in producing a quality course, and then we start doubting ourselves. Will people find value in this course? I’m just going to reduce the price. We keep going through this monologue in our heads until we’ve successfully destroyed any profit from our online course. If you have the intention of selling an online course every day, not charging high enough for your course could end up costing you more money. If you have an evergreen funnel selling your course every day, you most likely need to invest in Facebook ads to produce leads for your funnel. Well, what happens when you undercharge is, you end up never recouping your costs. Simple point is, you need to charge as much as you can for your online course. And understand, I’m not advocating for you to charge more than your course is worth. I’m advocating for you to discover what your course is worth, and then charging as close to that amount as possible. But many entrepreneurs struggle with this. If that’s you, give yourself a comforting pat on the back because you’re not alone! If you’re wondering why I skipped over $500-1,000, there’s a reason. Most often, courses that price themselves in that range are losing money because past a certain point, it doesn’t make much of a difference to the buyer. So a buyer who buys at $750 would most likely still buy at $1,000. So I just skip this pricing range entirely. 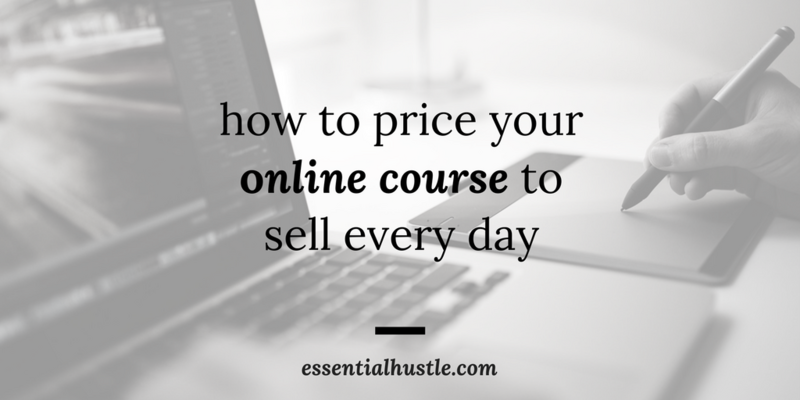 If you want to sell a course everyday, you don’t need to undercharge to do it. This is a common belief many entrepreneurs have, and it’s the reason most entrepreneurs price their course below $100. You’re teaching on a standard strategy for your subject matter. There’s no access to you. Doesn’t take you long to create. First off, if you’re teaching standard material (a strategy that you don’t necessarily own), then it would be fine to charge below $100. For instance, a course on “How to Use Drip Email Marketing” is something a person can find from Drip for free. This is standard teaching, and is not a strategy or process you own. Also, it shouldn’t take you long to create any course that’s below $100. If it’s taking you months to build, it’s most likely because you’re putting too much into it. I suggest only taking 1 week to create this course. Final thing to note: don’t judge the value of your course by its length. I’ve seen courses that are $300, but only contain a 1 hr video. It only depends on the result your customers see. Has a community component.Takes longer to create. People have already spent a similar value on your subject matter. Tackles a common problem with a bit of your strategy mixed in. Imagine you’re a new entrepreneur who buys a course on building your business online. You’re hungry for new clients, so you dive into a Facebook group (attached as a bonus to the course) and find a bunch of prospects for your services! You eventually end up scoring a new client from responding to a post in this Facebook group. As a result, you’ve received far more value from buying this course. If you’re giving your customers an opportunity to interact, find friends, and possibly book new clients, then you should be charging within this range. Another thing to note: if your target audience has spent a similar value on something else directly tied to your course, then you should charge in this range. For instance, I have a client who realized people were buying expensive DSLR cameras, but didn’t know how to use them. He knew his target audience was already spending a lot of money on their cameras, so he charged a slightly less amount for his course. If you’re teaching a course on how to host successful networking events, then think about what your target audience is already spending to put together a successful event. If they’re spending a large amount, chances are, your course price will fall somewhere in this range. Final thing: if you are offering any sort of strategy that you came up with, even if it’s just a bit, charge within this range. Here’s why: if you’re the one coming up with strategy, you’re the expert. It’s one thing to just regurgitate information to people, but it’s another thing to teach people something they’ve never heard before. Let me offer some examples of this. Let’s say you’re teaching a course on “How to Promote a Blog Post.” It’s a standard subject with some standard strategy, like share on social media, send to your email list, etc. BUT, if you include a bit of your secret formula (or, your own unique way of promoting a blog post), then this is information people can’t get elsewhere (meaning, they should pay higher). This is the price range I encourage most course-selling businesses to move to. It involves selling a premium, all-inclusive, comprehensive course. Helps people make their money back. The course is for a specific audience, solving a specific problem, with a specific strategy. Students have community and access to you. You have successful students of your method. You are considered an expert in your field. To begin, if you are selling a course that helps people recoup their costs somehow, then you should be charging a higher price point. For instance, let’s say you offer certification with your course. This certification can help your students book high-paying clients. With this in mind, people will essentially be making money back from their purchase. If you are solving a specific problem for a specific audience with a specific strategy, then you should charge within this range. For example, if you were a writer who wanted to buy an online course for how to use email marketing, which of these courses do you think you would buy? I’m guessing you would buy the latter course, right? It addresses a specific audience: writers. It addresses a specific problem writers have: they want to launch a bestseller. It involves a specific strategy meant only for writers who want to launch a bestseller. If people know this course would solve their problem, they’ll be more likely to buy it above another course. This is why your course needs to be as specific as possible. Be specific on the audience, the problem you solve, and the goal you help your audience achieve. Final thing to say about this price range: if you are an expert in your field, and you have successful students who sing your praises, you should be charging a premium price. Your humility is costing you money. And when this happens, humility doesn’t remain humility. It becomes ignorance. If you have clients and students whose lives are better because of the results you helped them achieve, then you are an expert. If people come to you for help in a particular subject matter, then you are an expert. If you are someone who’s making good money in a particular field, and is attracting attention because of your skill, you are an expert. It’s time to sell your course like an expert. Where does your course fit? What price fits your course? Point is: charge as high as possible and keep growing. If you need further help in pricing your online course, download my FREE checklist to help you price your course. The checklist will help you determine the price range for all of your courses. In the next article, I’ll teach you how to structure your offer for an evergreen course funnel. If you want profitability with your funnel, this is a MUST READ. But for now, find the best price for your course and don’t be afraid to charge outside your comfort zone.